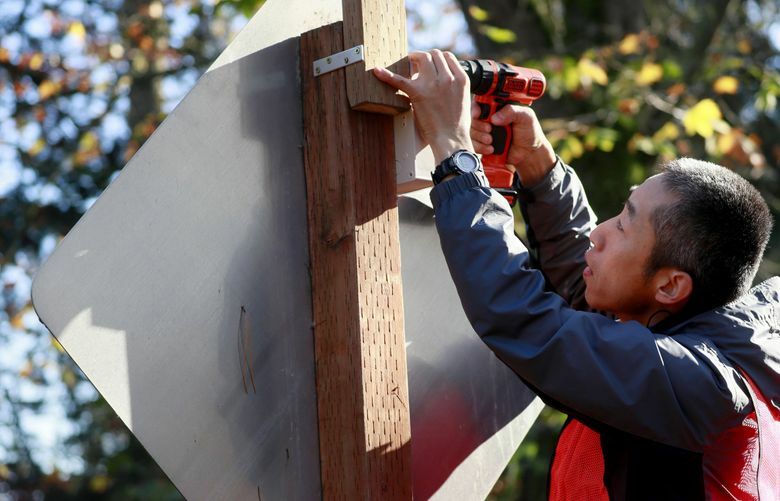 The UW team is installing sensors this month along the trail in Lake Forest Park, near the junction of Highway 522 and Ballinger Way Northeast, to test an app-based system that would alert drivers and cyclists if they are about to cross paths. On warm days, more than 2,000 riders can pass busy spots on the Burke-Gilman. In the area where the sensors are being installed, motorists cross the trail to reach houses and the historic Lake Forest Park Civic Club along the lakeshore. Trail-side sensors represent a novel strategy within the flourishing science of connected vehicles. 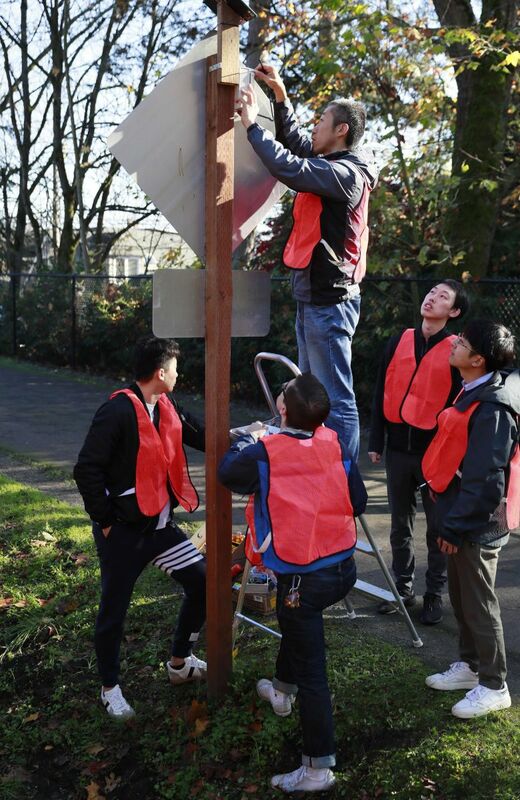 “Some cars might be able to tell you if another car is coming, but they can’t see pedestrians or bicyclists,” says the UW’s Smart Transportation Applications & Research (STAR) Lab. “Practically everybody has a smartphone,” and therefore an app-based system can spread quickly, said Yifan Zhuang, a Ph.D. student on the team. 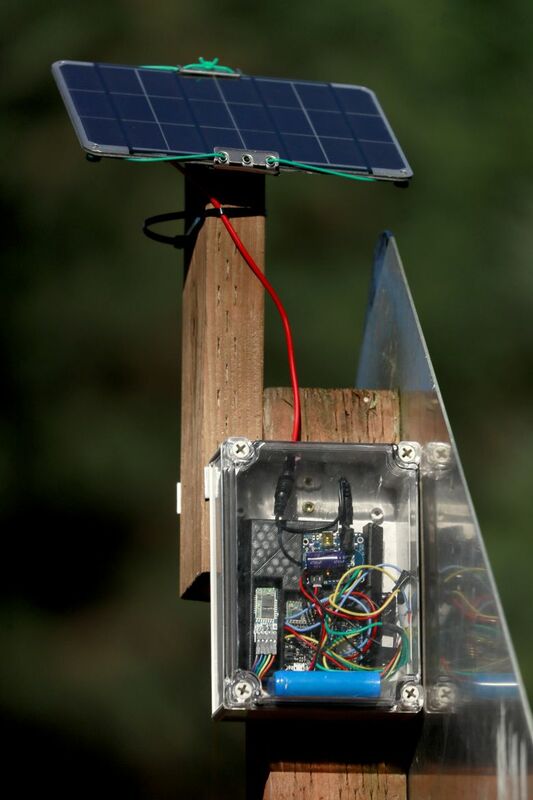 The STAR detection system still requires months of testing, by researchers carrying the equipment, before apps might be available to the public, Zhuang said. STAR’s technical proposal won support from the national Transportation Research Board, part of the National Academy of Sciences, Engineering and Medicine. A preliminary test on the UW campus found it near 90 percent reliable, the proposal paper said. Transmitters can operate 20 to 30 days on battery power if solar recharging fails, Zhuang said. Lake Forest Park already is outfitted with signs, low speed limits, and signals that, if obeyed, would avert crashes. But Zhuang said legal right turns still bring cars and bikes into proximity where an app could enhance safety. At the Ballinger crossing, the trail curves toward Highway 522 and the intersection’s crossing light — which causes short sightlines ahead for southbound cyclists. Just one noninjury bike crash was reported at the corner from 2013-17, says a statewide map by Colburn Law Firm of Issaquah. Nationally, casualties to “vulnerable users” have increased since 2009. Last year 5,977 pedestrians and 783 bicyclists died in crashes nationwide. But the STAR strategy raises questions: Would people become too dependent on tech, instead of slower speeds and eye contact, to avoid crashes? Does the app discriminate against those who can’t afford a cellular plan, or wish to enjoy the trail e-free? Toyota already offers laser- and radar-based pedestrian recognition for straight and well-lit streets, while warning drivers to stay alert and responsible. Potentially, pedestrian-avoidance software might save 800 lives a year, says the U.S. Department of Transportation’s Volpe Center. The STAR app adds the advantage of “seeing” around corners or at night. How drivers here would react isn’t known. A British study found the most accurate time to warn drivers is two seconds before impact, but that’s barely enough time to brake, so motorists preferred five seconds even if that triggered some false alarms. Claire Martini, policy manager for the 16,500-member Cascade Bicycle Club, predicts cyclists will continue to trust their senses of sight and hearing, rather than apps. “With distracted driving on the rise and already a leading cause of crashes, it’s counterintuitive to have people looking down at their phones as they approach a high-conflict area,” she said. Zhuang said the team intends to eventually build a “no-vision alert method” using audio or vibration. Martini prefers four-way stops, or amber flashers that automatically trip when a cyclist approaches, as on the Westlake Avenue protected bike lane in Seattle. Better yet, build connected routes of protected bike lanes that remove conflicts, she said. Despite misgivings about this product, Martini said she appreciates the effort to create bike-related technologies. The Seattle Department of Transportation is researching a system called “Give Me Green” that would save time for cyclists by turning a traffic light green for them sooner. 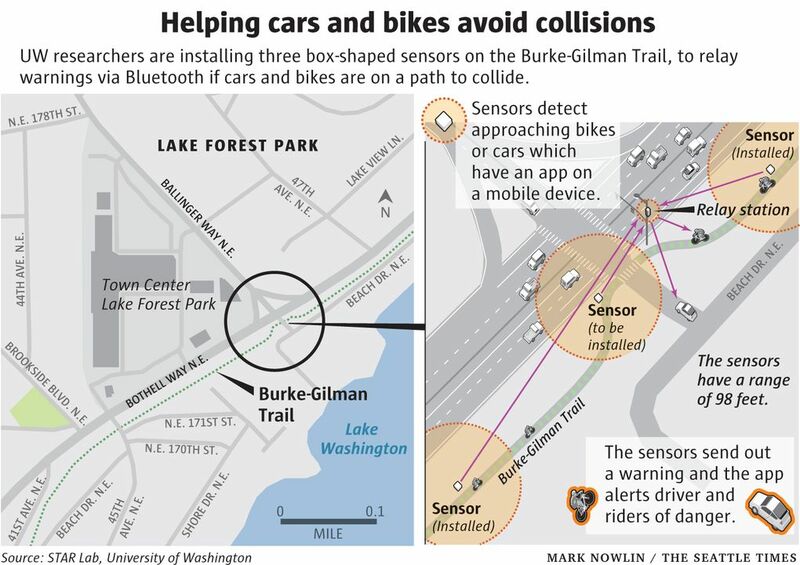 That system, to be tested near UW, may reduce red-light running by cyclists, the city says. As with other technologies, the skills and software being refined in Lake Forest Park might blaze a trail toward some solution we don’t yet see.